The Small Back Room (1949) is a film by the British producer-writer-director team of Michael Powell and Emeric Pressburger starring David Farrar and Kathleen Byron and featuring Jack Hawkins and Cyril Cusack. It was based on the novel of the same name by Nigel Balchin. In the United States, the film was released as Hour of Glory. 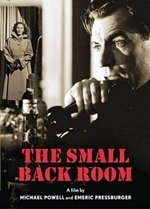 The Small Back Room was nominated for a 1950 BAFTA Award as "Best British Film".